Holding a G.I. 1911 in hand, admiration seeps within, reminding us of the greatest generation who walked before us … true patriots. Those men knew what had to be done! Today, Auto Ordnance honors the famous “fighting iron” by implementing the traditional method of color case hardening (CCH). Simply stated, CCH is the ancient heat-treating method of steel and hardening it for an intended purpose. One of its side effects is the beautiful explosion of mottled colors the steel takes on after Tyler Gun Works performs their magic. 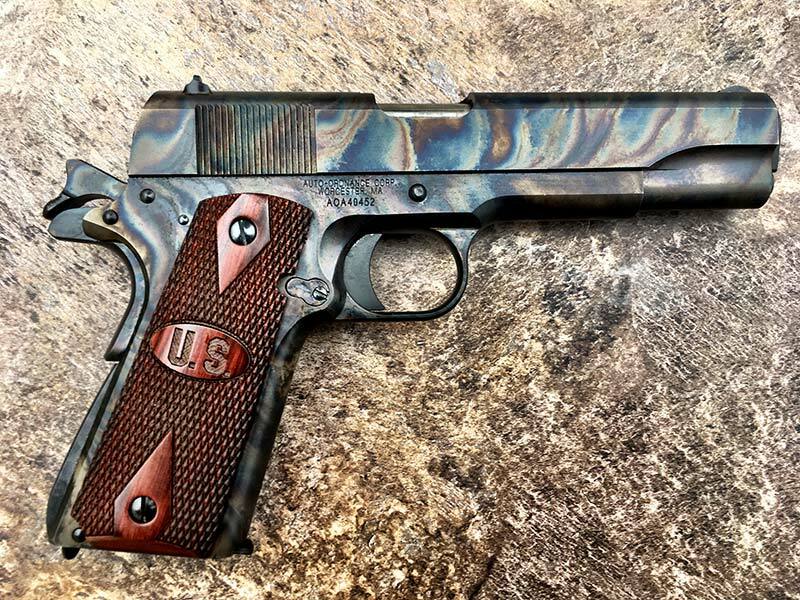 What better way to stylishly dress up a time honored, traditional fighting gun then to use a traditional CCH finish to transform the 1911 into a functional work of art? Owning a working piece of history is cool, especially when it shoots better than the original! Auto Ordnance equipped these pistols with precision-machined barrels, giving these working pieces of history some mighty fine accuracy. Beneath the brindled swirls of beauty is an all-steel 5" G.I.-pattern 1911 chambered in potent .45 Auto. The traditional checkered wood grips are complete with a bold “US” logo leaving no doubt where this pistol is from. A drift-adjustable dovetailed rear sight matched with a barleycorn front sight makes for a rugged combat sight system that has passed the test of time. A traditional beaver-tail grip safety, thumb safety and firing pin block round out the package. Going 6 for 7 at 10" steel plates at 50 yards, and grouping roughly 2.5" at 25 yards for 5 shots with certain ammo gives some idea of accuracy potential. My trigger broke at an averaged 5 lbs., 11oz. for 10 pulls when measured with a Lyman trigger-pull gauge. The Auto Ordnance 1911GCH weighs 39 oz., and overall length is 8.5". It ships with one seven-round steel magazine and has an MSRP of $1,327. For more info: www.auto-ordnance.com, Ph: (508) 795-3919.